After Facebook allowed fan pages to switch over to the timeline layout last Wednesday, it’s pretty obvious this week’s Facebook tips is all about the new layout. On Wednesday I did a quick tutorial on some of the basics of switching to the timeline layout, today I’ll go a bit more in depth. Let me start of by saying the new timeline is really sick, and will be much better. No one likes change, but just adapt to it asap and you’ll be used to it in no time. You don’t really have an option either, as Facebook will force you to switch no later than March 30th 2012. Once again Facebook decided to remove to link button, so most people might not know how to post a URL in a post without showing the URL. It’s pretty simple. Copy the URL of the blog post or video in the status update bar, hit the spacebar once and wait for Facebook to populate a thumbnail. If your blog post has multiple images you can choose which photo (thumbnail) you want to show. Now delete the URL and type your text. Once you’re done hit “post” and you’re all set! This works the exact same way for your personal profile FYI. Keep it clean! Make sure you put in the about section what you want people to know that are new to your brand. In the timeline the about section shows up right under your cover photo, so everyone that comes to your page will see this text. Keep it short and simple, but make sure you say what you want people to remember. 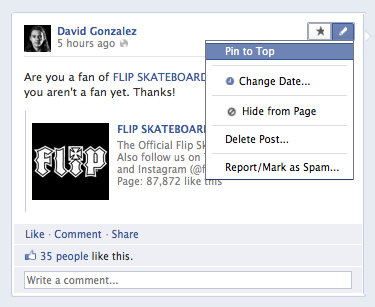 In complete Pinterest stylo Facebook now gives you the option to bring any post from the past to the top of your page. Want to highlight that video one more time, that cool photo or the event that is coming up? Pin the post and it will be on the top of the page for a maximum of 7 days. Go to the right upper corner of your post and click on the pencil. In the drop down menu click on “pin to top” and you’re done. Now the post will show up on the top of your page, with an orange icon on the upper right. FYI: You can only pin one post at a time. Once you pin a new post the older pinned post will move back into the timeline. sure that if you star a photo that it’s of decent size/resolution, so it doesn’t get all blurry. 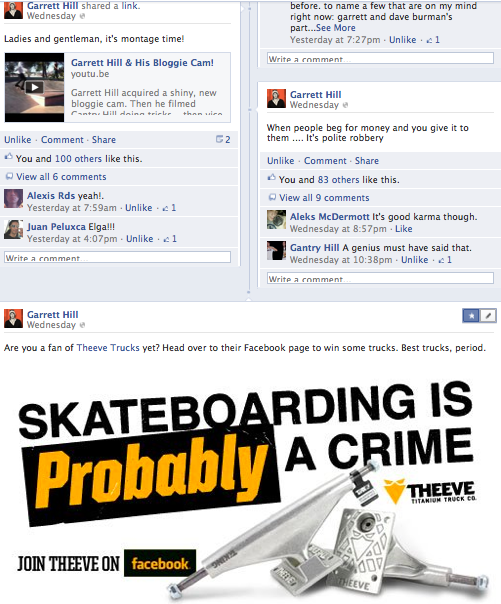 See here an example of a Theeve trucks post on Garrett Hill’s Facebook page. To star a post go to the upper right corner of your post and click on the star icon. You can star multiple posts, but don’t overdo it. You want to draw attention to a few key posts, not all your stuff. 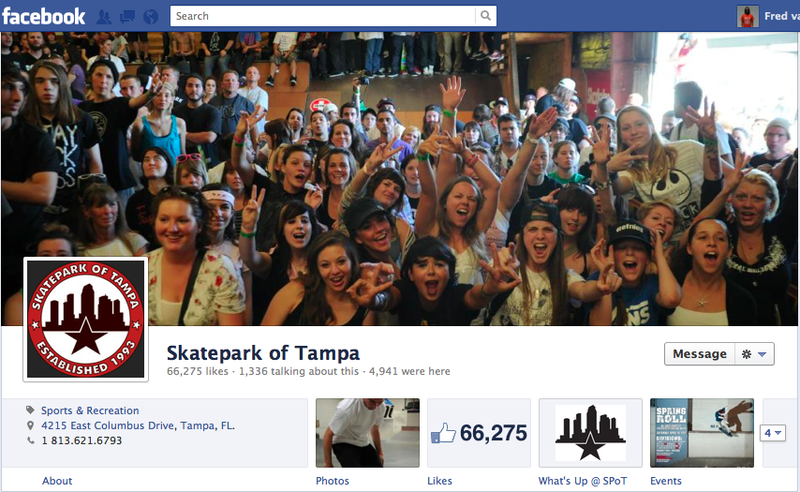 With the new timeline everyone will see your cover photo first. You can’t have people that aren’t a fan (of your page) yet land on a different (welcome) page. Underneath the cover photo, on the right side, there is room for 4 tabs. The first one in the row, on the left, is always the “photo” tab. The other 3 tabs can be whatever you want. You can decide which other tabs you want to show there, and in which order. Technically you can have up to 12 tabs, but you have to click on the arrow next to far right tab to see the other 8 tabs. FYI; I just checked out 30 different skateboard brands and barely anyone had changed their page to the timelime yet. Pretty shocking! Props to SPoT for adapting so quick! You can also decide to put one of your custom tabs in the main row. In the example above you see “photos”, “likes”, “what’s up @ SPoT” and “events”. Again, the “photos” tab will always be in the position where you see it now. The “like” tab is not really needed since you already see the number of total likes (fans) next to the profile picture. I strongly suggest adding the YouTube tab there (which you can install really easy) and then go with 2 other tabs that showcase your brand, organization, or shop. I recently built 2 custom tabs for Garrett Hill and David Gonzalez that showcase their sponsors. Below is part of the Garrett Hill one. Go to the actual tab to see it in full. 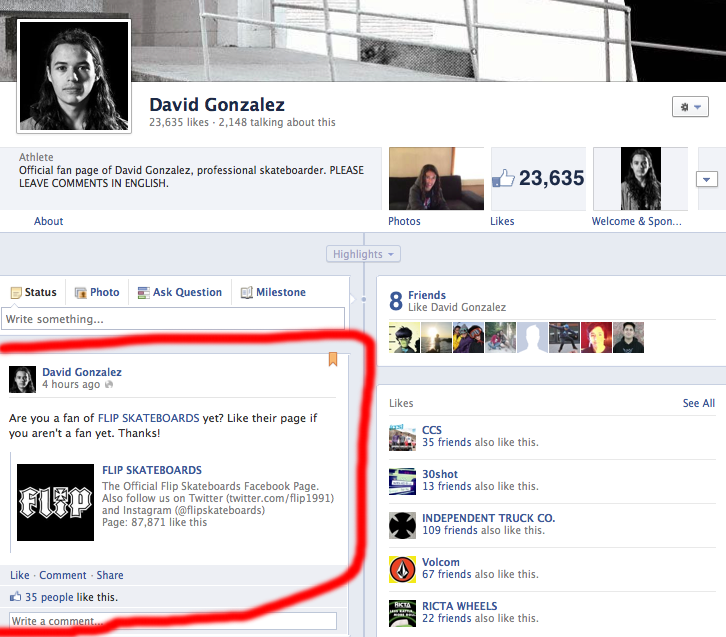 Also check out the sponsor tab I did for David Gonzalez. 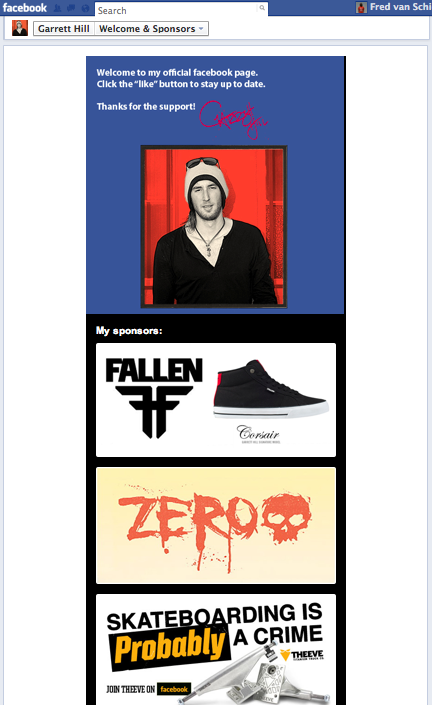 Each sponsor logo links to the Facebook page of that brand, so in this case the rider is helping the brand gain more (legit) fans. Please note that these tabs where designed for the old specs of the Facebook page (516px wide). With the timeline the tabs can be up to 810px wide, so expect an update of both tabs very soon. If you are interested in building custom tabs for your Facebook page and you don’t know how or don’t have the time for it feel free to hit me up. I can built and host multiple Facebook tabs for you. Just email me at [email protected] and I’ll let you know how it would work. Don’t forget to check out the Facebook post from last Wednesday with a step-by-step tutorial on how to switch over the the timeline, including all the specs for the cover photo and the profile image.